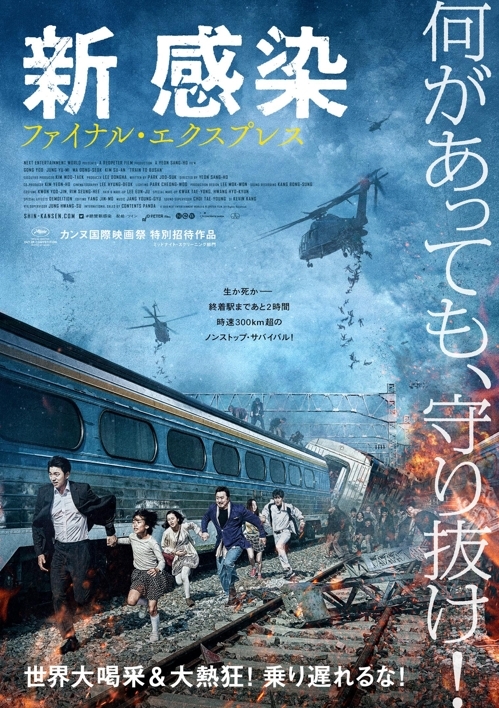 SEOUL, July 25 (Yonhap) — “Train to Busan,” South Korea’s 2016 zombie apocalypse blockbuster, will open in Japanese theaters in September, according to its distributor Tuesday. The film directed by Yeon Sang-ho will be screened at 148 theaters in 44 Japanese cities starting Sept. 1, according to NEW. “Train to Busan” was the top grossing movie at the South Korean box office last year, watched by more than 11 million moviegoers. The plot centers around a group of ordinary people trying to survive a mysterious zombie virus by boarding an express train bound for Busan, a southern port city that has fended off the outbreak. The movie will also be available for a special ScreenX screening. Developed by South Korea’s CJ CGV, ScreenX delivers an immersive 270-degree viewing experience by using two side screens in addition to the cinema’s existing main screen. Yeon plans to travel to Japan next month for a publicity tour and to meet with local fans.